Sri Ramakrishna was born on 18 February 1836 in the village of Kamarpukur about sixty miles northwest of Kolkata. His parents, Kshudiram Chattopadhyaya and Chandramani Devi, were poor but very pious and virtuous. As a child, Ramakrishna (his childhood name was Gadadhar) was dearly loved by the villagers. From early days, he had strong disinclination towards formal education and worldly affairs. He was, however, a talented boy, and could sing and paint well. He was fond of serving holy men and listening to their discourses. He was oftentimes found to be absorbed in spiritual moods. At the age of six, he experienced the first ecstasy while watching a flight of white cranes moving against the background of black clouds. This tendency to enter into ecstasy intensified with age. His father’s death when he was seven years old served only to deepen his introspection and increase his detachment from the world. When Sri Ramakrishna was sixteen, his brother Ramkumar took him to Kolkata to assist him in his priestly profession. In 1855 the Kali Temple at Dakshineswar built by Rani Rasmani was consecrated and Ramkumar became the chief priest in that temple. When he died a few months later, Ramakrishna was appointed the priest. 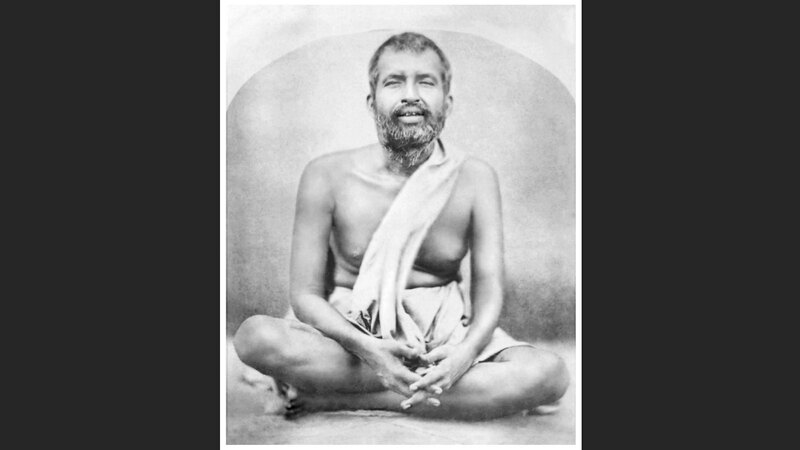 Ramakrishna developed intense devotion to Mother Kali and spent hours in loving adoration of her image, forgetting the rituals of priestly duties. His intense longing culminated into the vision of Mother Kali as boundless effulgence engulfing everything around him. Sri Ramakrishna’s God-intoxicated state alarmed his relatives in Kamarpukur and they got him married to Sarada, a girl from the neighbouring village of Jayrambati. Unaffected by the marriage, Sri Ramakrishna plunged into even more intense spiritual practices. Impelled by a strong inner urge to experience the different aspects of God he followed, with the help of a series of Gurus, the various paths described in the Hindu scriptures, and realized God through each of them. The first teacher to appear at Dakshineswar (in 1861) was a remarkable woman known as Bhairavi Brahmani who was an advanced spiritual adept, well versed in scriptures. With her help Sri Ramakrishna practised various difficult disciplines of the Tantrik path, and attained success in all of them. Three years later came a wandering monk by name Totapuri, under whose guidance Sri Ramakrishna attained Nirvikalpa Samadhi, the highest spiritual experience mentioned in the Hindu scriptures. He remained in that state of non-dual existence for six months without the least awareness of even his own body. In this way, Sri Ramakrishna relived the entire range of spiritual experiences of more than three thousand years of Hindu religion. Sri Ramakrishna did not write any book, nor did he deliver public lectures. Instead, he chose to speak in a simple language using parables and metaphors by way of illustration, drawn from the observation of nature and ordinary things of daily use. His conversations were charming and attracted the cultural elite of Bengal. These conversations were noted down by his disciple Mahendranath Gupta who published them in the form of a book, Sri Sri Ramakrishna Kathamrita in Bengali. Its English rendering, The Gospel of Sri Ramakrishna, was released in 1942; it continues to be popular to this day on account of its universal appeal and relevance. The goal of human life is the realization of the Ultimate Reality which alone can give man supreme fulfilment and everlasting peace. This is the essence of all religions. The Ultimate Reality is one; but it is personal as well as impersonal, and is indicated by different names (such as God, Ishvar, etc) in different religions. The Ultimate Reality can be realized through various paths taught in world religions. All religions are true in so far as they lead to the same ultimate Goal. Purity of mind is an essential condition for the attainment of the Ultimate Reality; real purity is freedom from lust and greed. External observances are only of secondary importance. Through spiritual practices man can overcome his evil tendencies, and divine grace can redeem even the worst sinner. Therefore one should not brood over the past mistakes, but should develop a positive outlook on life by depending on God. God realization is possible for all. The householders need not renounce the world; but they should pray sincerely, practise discrimination between the Eternal and the temporal and remain unattached. God listens to sincere prayer. Intense longing (vyakulata) is the secret of success in spiritual life. God dwells in all people but the manifestation of this inner Divinity varies from person to person. In saintly people there is greater manifestation of God. Women are special manifestations of Divine Mother of the Universe, and so are to be treated with respect. Since God dwells in all people, helping the needy should be done not out of compassion (which is an attitude of condescension) but as humble service to God. Egoism, caused by ignorance, is the root-cause of all suffering. Life is an expression of the spontaneous creativity (Lila) of God. Pleasure and pain, success and failure, etc are to be borne with patience, and one should resign oneself to God’s will under all circumstances. Bridge between the ancient and the modern: Sri Ramakrishna is the real link between the ancient and the modern. He showed how the ancient ideals and experiences could be realized even while following the normal modern way of life. Boost to moral life: Sri Ramakrishna’s emphasis on truthfulness and renunciation of lust and greed has given a great boost to moral life in modern times. He also cleansed religious life of immoral practices, external pomp, miracle mongering, etc. Divinization of love: Sri Ramakrishna elevated love from the level of emotions to the level of the unity of all Selves in God. Although the principle of oneness of the Supreme Self and its immanence in all beings is a central point in the Upanishads, it was seldom applied in practical life. Sri Ramakrishna saw the Divine in his wife, in his disciples, in others, even in fallen women, and treated them all with respect. The famous dictum of the New Testament, “God is Love”, found its verification in Sri Ramakrishna. Divinization of love and human relationships is another contribution of Sri Ramakrishna which has immense significance for the welfare of humanity. One cannot have the vision of God as long as one has these three – shame, hatred, and fear. Be not a traitor in your thoughts. Be sincere; act according to your thoughts; and you shall surely succeed. Pray with a sincere and simple heart, and your prayers will be heard. Do not let worldly thoughts and anxieties disturb your mind. Do everything that is necessary in the proper time, and let your mind be always fixed on God. You should remember that the heart of the devotee is the abode of God. He dwells, no doubt, in all beings, but He especially manifests Himself in the heart of the devotee. The heart of the devotee is the drawing room of God. Pure knowledge and pure love are one and the same thing. Both lead the aspirants to the same goal. The path of love is much easier. Who is the best devotee of God? It is he who sees, after the realization of Brahman that God alone has become all living beings, the universe, and the twenty-four cosmic principles. One must discriminate at first, saying ‘Not this, not this’, and reach the roof. After that one realizes that the steps are made of the same materials as the roof, namely, brick, lime, and brick-dust. The devotee realizes that it is Brahman alone that has become all these — the living beings, the universe, and so on. Live in the world like a waterfowl. The water clings to the bird, but the bird shakes it off. Live in the world like a mudfish. The fish lives in the mud, but its skin is always bright and shiny. I tell you the truth: there is nothing wrong in your being in the world. But you must direct your mind toward God; otherwise you will not succeed. Do your duty with one hand and with the other hold to God. After the duty is over you will hold to God with both hands. The breeze of His grace is blowing day and night over your head. Unfurl the sails of your boat (mind), if you want to make rapid progress through the ocean of life. One should constantly repeat the name of God. The name of God is highly effective in the Kaliyuga. The practice of yoga is not possible in this age, for the life of a man depends on food. Clap your hands while repeating God’s name, and the birds of your sins will fly away.